The early history of preventive conservation is characterized by the progressive integration of science into the museum world and the strengthening of collaboration between curators, conservators and scientists. This article traces the development of this discipline in Great Britain and in the United States, examining the role played by museum controversies, public debates, and pre- and post-war efforts, between 1850 and 1950. Les débuts de la conservation préventive se caractérisent par l’intégration graduelle de la science dans l’univers des musées et par le renforcement de la collaboration entre conservateurs, restaurateurs et scientifiques. Le présent article retrace le développement de cette discipline en Grande-Bretagne et aux États-Unis entre 1850 et 1950, en examinant le rôle particulier des controverses, des débats publics et des efforts d’avant et d’après-guerre. The author wishes extend his deepest gratitude to Joyce Hill Stoner (coordinator FAIC Oral History Project - http://tinyurl.com/​n37em8r) and to Maria Mata Caravaca (Archivist at ICCROM). Special thanks to Jennifer Copithorne, Julie Stevenson and Jane Sirois for their comments on the manuscript and to ICCROM, the National Gallery London, the Victoria and Albert Museum, the British Museum, the Worcester Art Museum, the National Library of Wales, and the National Museums of Scotland for the permission to use their images. 1In many ways, the history of the preventive conservation of museum collections (and arguably of conservation in general) is the story of how science slowly made its way into the museum world, and of the realization that caring for objects one by one is not always feasible or effective. Preventive conservation comprises “all measures and actions aimed at avoiding and minimizing future deterioration or loss” (ICOM-CC 2008). The term was first used in the early 1970s, but the basic concept of preventing the deterioration of cultural materials has always existed (Lambert 2008; 2010). This article outlines a history of the emergence of a consciousness for preventive conservation at an institutional level. Here, examples are drawn from Great Britain and the United States over a period of 100 years, yet in full acknowledgement that other countries also contributed to this early development. 2In many institutions around the world, resources for conservation are diminishing, and regardless of preventive conservation’s potential for cost-effectiveness, many collections professionals still struggle to convince decision-makers of its importance relative to other museum expenditures. This historical review shows the scale of the positive impact preventive conservation can have on collections and the tenacity with which early adopters, who were well aware of its merits, pursued its more definitive integration into museum practice. 3Often recognized as one of the early promoters of preventive conservation, Garry Thomson, Scientific Advisor to the Trustees of the National Gallery from 1960 to 1985, commented that as far as the mid 19th century, there existed a strong understanding of the effects of the environment on museum objects. This period, he argued, was followed by “Dark Ages,” in which exhibit design, architecture and the public’s comfort took priority over conservation (Thomson 1970–1971, 137). 4Thomson’s Golden Era begins around 1850, when a Select Committee inquiry was opened to investigate “the dirty and obscure state” of paintings in the National Gallery (Select Committee 1850a, 176). Admittedly, the Gallery’s Trustees had been receiving complaints about “the heat and foulness of the rooms” since 1839 (Saunders 2000, 77). So, a three-member Government Commission was finally created to look into the issue. This Commission was composed of the Gallery’s keeper Sir Charles L. Eastlake, the painter W.S. Russell and Michael Faraday, who was the most sought-after chemist in England at the time. 5Eastlake, Faraday and Russell (1850) blamed the film of dirt covering the paintings on both the Gallery’s location near a multitude of chimneys that blew large amounts of smoke into the air, and on the high visitor traffic (Fig. 1). Fig.1 The National Gallery’s roof looking towards the heavily polluted Trafalgar square area. From the Daily Graphic, 6 June 1895, p. 968. Courtesy of the National Gallery (www.nationalgallery.org.uk). 6They recommended that paintings be entirely encapsulated in shadow boxes, or protected with glass and backed with tin foil or “some other impermeable substance” to prevent the deposition of dust and other pollutants. Already, evidence showed that paintings under glass were in better condition than the others. The Select Committee agreed with these recommendations, and further advised that small children be excluded from the Gallery, as the British Museum had done, to reduce the amount dirt, food and “little accidents” in the galleries (Select Committee 1850a, 177; 1850b, 92). The possibility of relocating the Gallery was raised, but this suggestion never materialized into concrete recommendations. 7Three years later, it would seem that conditions had not much improved when another Select Committee–also involving Faraday–was set up to inquire into the Gallery’s management practices (Brommelle 1956). The Committee complained that none of the recommendations of the 1850 report had been implemented: “The state of the pictures tends to show the general absence of combined action or definite responsibility in the system of management” (Select Committee 1853, 97), and reiterated the need to protect the paintings from the front and from the back. 8To Eastlake, it seemed impossible to do something about the source of the pollution. Charles Barry, a Committee member, suggested installing an air conditioning system similar to the one recently installed in the new Houses of Parliament (of which he was the architect). This system had been designed by D.B. Reid. It could humidify, dry, cool and wash pollutants from the air using lime-charged water (Reid 1844, 118; Brown and Rose 1997). Eastlake felt that such a system would be required if the Gallery remained on its present site. 9In the end, no air conditioning system was installed. Around 1860, the visitors’ comfort would take precedence over conservation, as the galleries were fitted with large windows that were kept open to promote air circulation (Brommelle 1956). This, of course, only let more pollutants inside. At that time, most of the paintings–except one–had been put under glass (Saunders 2000). This had been an attempt at balancing the public’s needs with that of the collection. 10Nevertheless, in 1950 (ninety years later) Sir Philip Hendy, the Gallery’s director at the time, still blamed the absence of air conditioning for the deterioration of the paintings (Hendy 1950). Later that year, the National Gallery would finally install an air conditioning system, first in one room. The difference with the other galleries was phenomenal: “On one very foggy day towards the end of 1950 when the rest of the gallery was visibly murky, Room XXIX remained completely clear of fog” (Keeley & Rawlins 1951, 195). Throughout this process, new knowledge had been developed about the effects of the surrounding environment on artworks; this was fostering innovative solutions to better protect collections from the causes of damage, where tackling these causes was not possible. 11Henry Cole, the South Kensington Museum’s (now the Victoria and Albert Museum) founding director, wanted to institute a museum for the people. In the second half of the 19th century, there was a strong push from government to improve public access to collections to steer the masses towards high culture instead of other morally reprehensible activities. 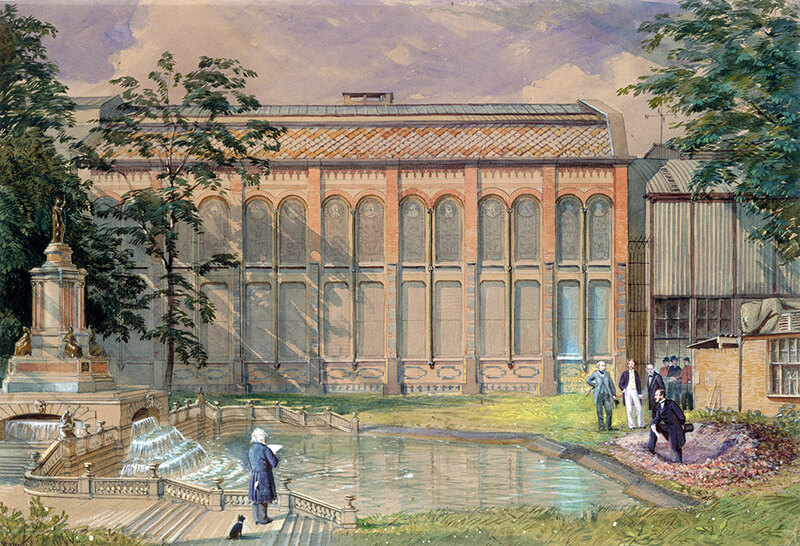 When the Museum opened its doors in 1857, visitors of the Sheepshanks Gallery (Fig. 2) were the first in museum history to experience an artificially lit exhibition. © Victoria and Albert Museum. 12The system consisted of a single 25-meter pipe mounted 5 meters from the floor, fitted with fish-tail gas jets on either side. The jets were ignited by a pilot light that travelled on a track below (Fig. 3). Gas burners similar to those installed at the South Kensington Museum. Courtesy of the Trustees of the National Museums of Scotland. 13With this new technology, the gallery could welcome visitors until 10 p.m. three days per week. Initially, gaslights and evening openings received rave reviews, causing several other museums to follow suit (Swinney 1999, 2003). Soon, however, extended opening hours would give rise to heated debates and propel preventive conservation into the public arena. 14The South Kensington Museum’s innovative idea was putting pressure on other large institutions in London who did not share the same views. In 1860, the National Gallery expressed its opposition to the introduction of gaslights, claiming they would make the galleries “smoky and unpleasant” and unbearably hot (Brommelle 1956, 185); furthermore, evening openings were perceived as providing opportunities for “flirtatious activity” among young visitors and attracting delinquents from the nearby barracks. The British Museum also resisted evening openings, despite public appeals in the press, by Parliament, and in 1866, by Queen Victoria. In the end, the British Museum and the National Gallery were successful in defending their points and the idea was put on hold (Swinney 2002). 15In 1886, however, the public would once more demand extended hours. To pledge his case, F.W. Burton, the National Gallery’s director (1874–1894), argued that longer hours meant more visitors, and consequently, more risks to the paintings from pollutants brought in from the outdoors. He added that this would be aggravated by the “very hazardous level of artificial lighting” that would be required (Burton, cited in Brommelle 1964, 140). 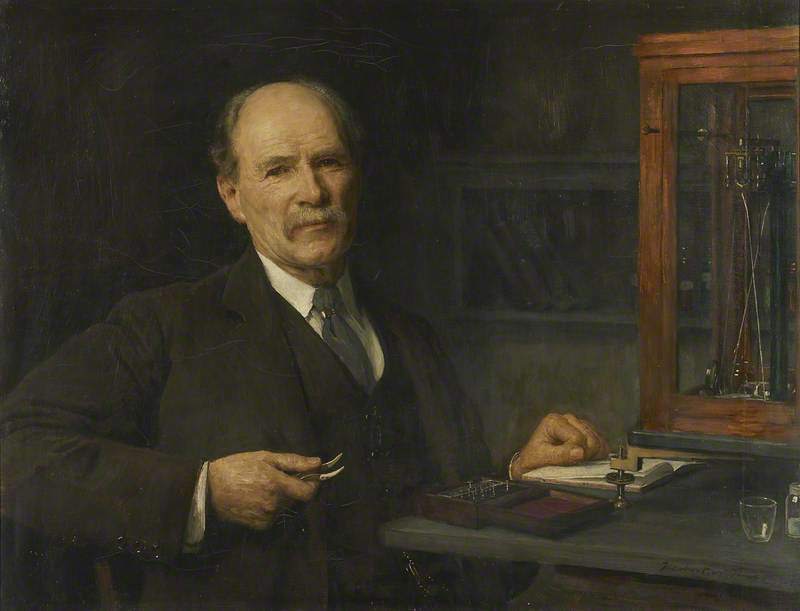 J.C. Robinson, Surveyor of the Queen’s Pictures (1880–1901), publicly supported Burton’s position, but took it one step further. 16Robinson claimed that at the South Kensington Museum–against which he may have had a grudge (Brommelle 1964)–an important collection of English watercolours was now completely faded because it had been exposed to daylight for the past 20 to 30 years: “in many cases the [watercolours] are now […] but the pale ghosts of their former selves” (Robinson, cited in Brommelle 1964, 140). 17In the months that followed, Robinson’s comments on fading gave way to vivid exchanges in The Times between painters and scientists (Brommelle 1964). Watercolour artists were worried about bad publicity, considering these allegations that their product would fade in a few years. The South Kensington Museum kept a relatively low profile but meanwhile, two scientists, Dr. W.J. Russell and Capt. W. de W. Abney were commissioned, quite literally, to shed some light on the debate. 18Russell and Abney conducted extensive experiments on 39 pure colours and 34 mixtures selected by a committee of 10 artists. They introduced numerous variables to examine how these would affect fading: different light sources (daylight, electric glow lamps, arc lamps and gaslights), wavelengths, intensities, exposure times and environments (dry, humid, without air, low oxygen, warm). In their report, Russell and Abney (1888, 172, 46) concluded that in the specific daylight conditions at the South Kensington Museum–at average intensities of about 170 lux–it would take approximately a century before “any very marked deterioration” would occur in a painting executed with the most stable colours; under gaslights or electric glow lamps at typical gallery intensities–about 7.5 lux for gaslights at the time (Swinney 1999, 114)–it would take thousands of years. They confirmed that in most cases, the presence of moisture and oxygen was necessary to cause an alteration: “It may be said that every pigment is permanent when exposed to light ‘in vacuo,’ and this indicates the direction in which experiments should be made for the preservation of water colour drawings” (Russell & Abney 1888, 46). Finally, they suggested that the harmful effects of blue-sky lighting could be minimized by using yellow-tinted glass or blinds. 19At the South Kensington Museum, Russell and Abney’s findings may have had a calming effect on those who were worried about extreme fading, and their technical recommendations (coloured glass panes and vacuum frames) appear to have been implemented to some extent. In 1893, the most deteriorated of a series of paintings by J.M.W. Turner was installed in a vacuum frame developed by W.S. Simpson, the “Simpson box” patented in 1892. Over 100 years later, and still in the frame, the painting’s condition was seemingly far superior to that of the others (Shiner 2007). 20The Russell and Abney study shows an exceptional awareness of deterioration mechanisms and of what could be done to slow them down. Alas, the first widely read recommendations for museum lighting aiming to mitigate deterioration would only appear in 1930 (Druzik & Eshøj 2007). 21Input from scientists was sought out whenever enough public pressure was exerted on museum administrators; yet, they still did not have a permanent place within museums. When the Select Committee on the National Gallery had suggested hiring a full-time chemist, Eastlake had said it would “complicate the machinery very much” (Eastlake, cited in Brommelle 1956, 185). As soon as he became director, Eastlake seems to have been “away buying pictures a great deal of the time” (Brommelle 1956, 185). One is left to speculate whether the creation of a new specialist position would have reduced his ability to acquire artworks. 22When fighter aircrafts first flew over European cities in 1914, no one could have fathomed the scale of the destruction that would follow. That September, the National Gallery moved its most valuable paintings into the cellars, placed them on racks as a flood mitigation measure, and covered the floor above with sand to help dampen the effect of explosions. When this location was no longer safe, the Gallery moved 675 of its paintings to various different locations over the course of the war–to private country homes, provincial museums and the unfinished Aldwych railway station (Saunders 1992). 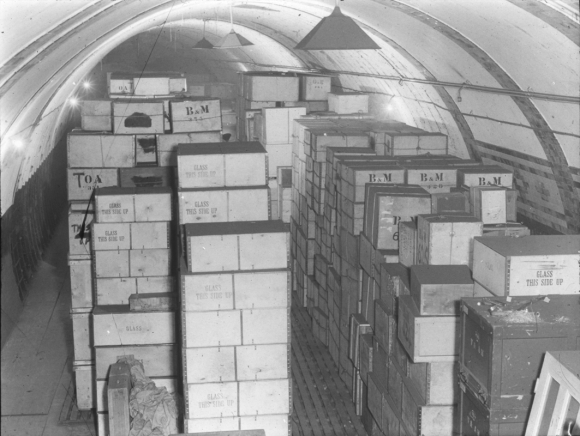 23At the British Museum, the most valuable objects were also moved to the basement, but as the bombing intensified, the Prime Minister and the War Cabinet ordered their evacuation to the abandoned underground railway tunnels of the Holborn Post Office (Fig. 4). 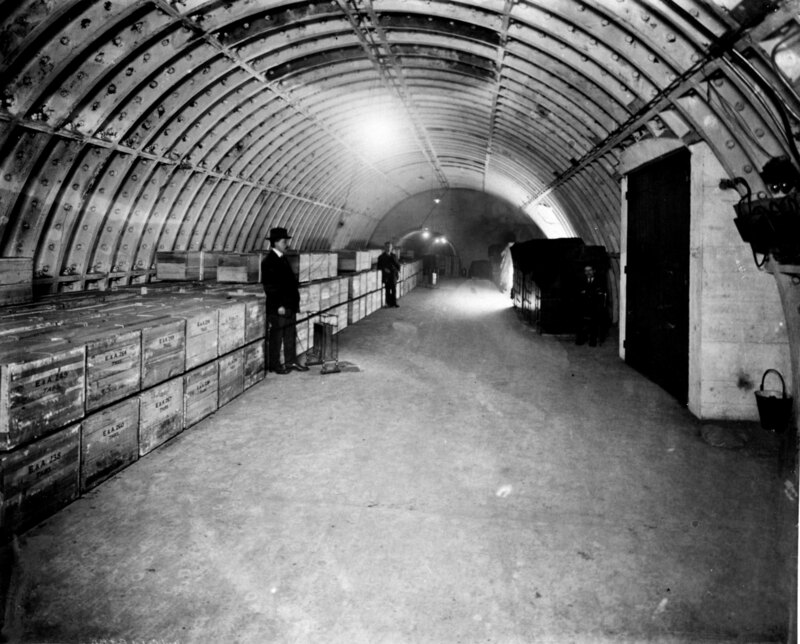 WWI storage in the Holborn Post Office railway tunnels. 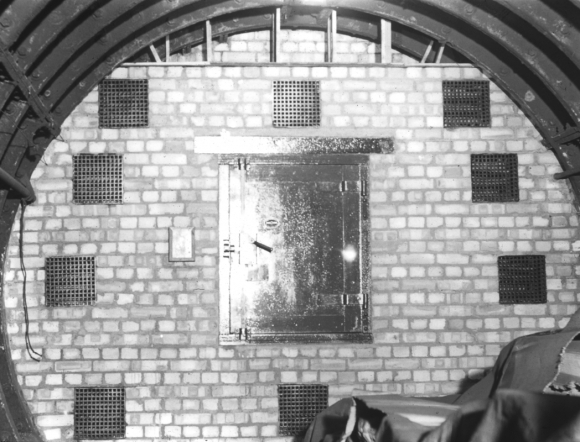 24The largest tunnels had been recently paved and fitted with electric ventilation and heating, and with environmental monitoring equipment. Books, drawings and prints were sent to the National Library of Wales in Aberystwyth, as the environment was deemed too humid for them in the London tunnels (Caygill 1992). After the Great War ended, the British Museum was fortunate enough to have avoided being hit, but when the objects were returned, no one could have expected what would follow. 25Many objects had been severely damaged after approximately two years of storage in high humidity; metal corrosion, mould and salt efflorescence were prevalent (Plenderleith 1943; 1998). Given the gravity of the situation, the Trustees asked for help from the Department of Scientific and Industrial Research (DSIR), who hired a very prestigious chemist, Dr. Alexander Scott retired since 1911 (Plenderleith 1978) (Fig. 5). Donated by Harold J. Plenderleith. Courtesy of the Trustees of the British Museum. 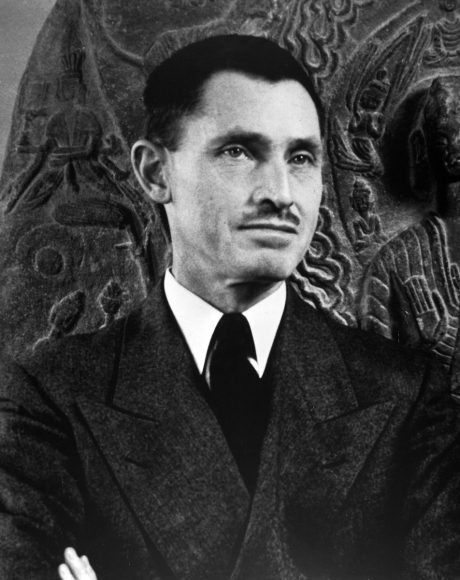 26Scott had never worked in a museum, but he did have an interest in art and antiquities. 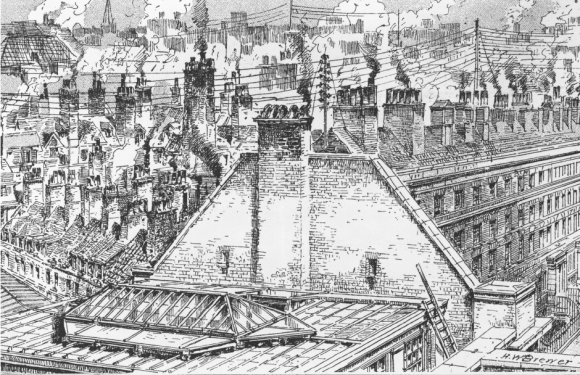 So, in 1920 the British Museum Research Laboratory was founded, and Scott worked two or three days a week out of a room in the Department of Prints and Drawings (Werner 1976). The quantity of work was so overwhelming that in 1922, two full floors of 39 Russell Square were converted into lab space and in 1924, the DSIR hired a full-time chemist for the Museum: Harold J. Plenderleith (Fig. 6). Dr. Scott’s method was to study the causes and symptoms of instability and to work out methods of treatment [...] It was thus possible to obtain a wide experience in dealing with museum objects and materials of all kinds and to obtain an insight in to the technical requirements of museums and picture galleries. This was essential because stability is, after all, a relative term and conservation only begins to have practical significance when the conditions under which things are to be conserved are clearly defined (Plenderleith 1943, 94). 28At that time, Plenderleith was extremely busy working on treatment manuals that would later be used as the basis of his most famous work, The Conservation of Antiquities and Works of Art: Treatment, Repair, and Restoration (1956). Building on Scott’s approach, Plenderleith developed new preventive conservation guidance in relation to storage conditions, temperature, relative humidity, light, dust, biological attacks, damage caused by the public and on the importance of on-going collections maintenance. 29For Scott and Plenderleith, the experience of dealing with the disastrous consequences of bad storage conditions on highly sensitive archaeological objects clearly emphasized the need to provide objects with suitable environments first. Ironically, disaster needed to strike for conservation to develop in Great Britain (Werner 1976), and the same would be true for the United States (Bewer 2010). It was a concern for the preservation of authority [...] for the connoisseur, who was the king of the art world in the 1920’s. Those were the great days of Berenson. There was contempt for concern about condition. That was as naughty as to inquire about the digestive system of an opera singer. You didn’t look into those things–it wasn’t proper. [...] It was prying into the inspired work of the artist... it was practically a work of God. In the trade it was very convenient to keep it that way (Stout, Buck & Gettens 1975, 15). Undated – probably late 1940s. © Worcester Art Museum, Boston. 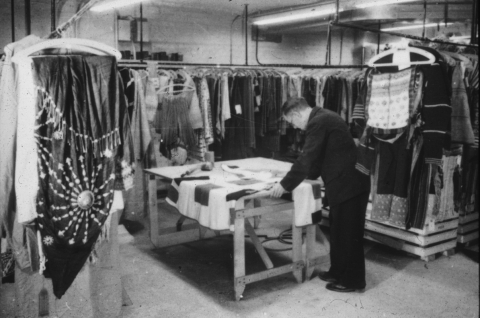 32A year later, the department enlarged and became the Centre for Conservation and Technical Research. Forbes hired R.J. Gettens, the first full-time chemist working inside a museum in the United States. Under Gettens, the aim of scientific and technological experiments at the Fogg was twofold: to improve the technique of contemporary artists and to provide future museum directors and conservators with a solid knowledge of conservation principles so that they could look after their collections adequately (Stout 1978, I). Indeed, it was only after the war, in the twenties and thirties, that the great museums began to appreciate the fact that, irrespective of the nature of their collections, scientific studies had something to offer to scholarship. A museum laboratory interested, even incidentally, in preventing the deterioration of objects was the logical complement of an atelier devoted to their restoration (Plenderleith & Philippot 1960, 278). 34In preparation for the imminent war, substantial efforts were under way to protect cultural heritage in Italy, Spain, France, the Netherlands, Belgium, Sweden, and in Great Britain (Lavachery & Noblecourt 1956, Lambert 2010). 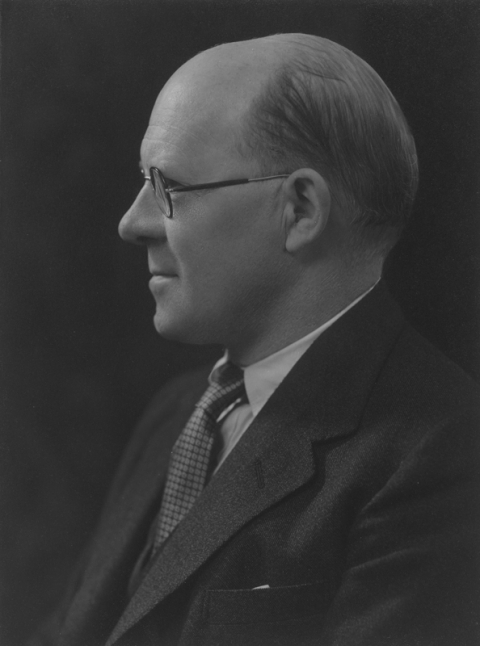 For years, Sir John Forsdyke, the British Museum’s director and principal librarian since 1936, had been a strong supporter of evacuating collections as soon as possible in preparation for the war. Forsdyke had edited a guide on protecting collections in times of war written by Plenderleith and his National Gallery colleague F.I.G. Rawlins. This time, the attacks would be swift and catastrophic, so the British Museum “decentralized” collections away from London (Plenderleith 1978, 47). 35Initially, the Museum obtained a few country homes (Plenderleith 1978), but in March of 1938 space was also allocated in the Aldwych Underground station (Fig. 8-9); incidentally, the same location used by the National Gallery during the previous World War. 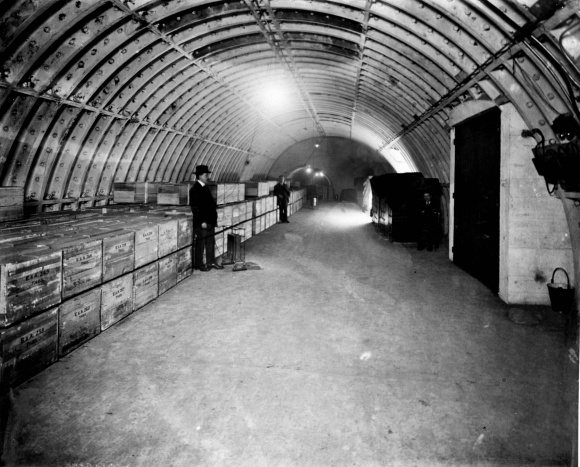 Aldwych Underground (Tube) station in London showing object cases stacked so as to promote air circulation. Aldwych Underground (Tube) station in London showing the partition built to help control environmental conditions. 36Once again, space was assigned to the British Museum in the National Library of Wales in Aberystwyth. Not too far from the Library, a secret climate-controlled tunnel was commissioned and completed in 1940 after 14 months of work (Caygill 1992) (Fig. 10). Commissioned by the British Museum for WWII collections storage–as they looked in 2012. Courtesy of National Library Wales. 37When the first airstrike hit London in September 1940, all of the British Museum’s objects had already been hidden away. In December 1940, however, the environmental conditions at Aldwych station had become unsafe for the objects and they urgently needed to be moved (Caygill 1992). 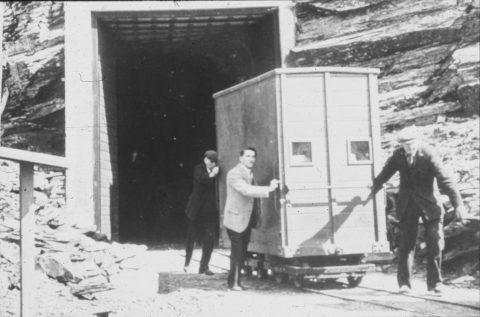 Considering the extent of the damage resulting from bad storage during World War I, taking extra precautions was not unwarranted. Now that the National Library of Wales was on an enemy flight path, the objects could not be transferred to the secret tunnel. So, they were transferred to an underground limestone quarry near Westwood in Wiltshire, about 200 kilometres from London. I said, “I want 60% relative humidity and 60 degrees F [15.5oC] […] If you give me those conditions I can put anything there.” […] When [the Ministry of Works] eventually handed it over in just a little over a year they had self-recording thermo-hygrographs with lines, straight lines (Plenderleith 1978). 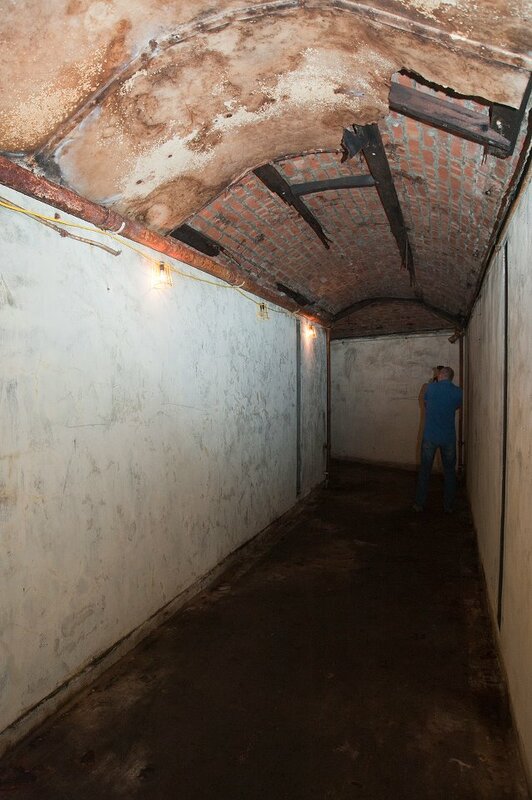 39To achieve this, the walls were waterproofed with silica-based paint (Plenderleith 1978) and an air conditioning system with cooling capacity was installed. Preliminary studies showed that heating only would not have been sufficient to lower the relative humidity. Initially, the system ran on boilers that consumed about 20 tons of coke fuel per year but these were later replaced with heat pumps, cutting costs in half (Pallot 1946). This space was also fitted with one of the earliest smoke detectors. Once the space was ready, the British Museum’s objects were moved to the quarry on 24 February 1942 (Fig. 11). Located about 10 km from Bath, used as collections storage during WWII. 40Collections from the Victoria and Albert Museum, the National Portrait Gallery, works from private collections and from about 30 other institutions were also moved into the refurbished quarry (Caygill 1992) (Fig. 12-13). The Ministry of Works maintained the space, renewed the wall coating, inspected the air-conditioning system and monitored the environmental conditions. Used by the British Museum, the Victoria and Albert Museum and others. 41In the end, the considerable effort deployed to control the environmental conditions paid off. When the war ended, all the British Museum’s objects were returned without any damage (Plenderleith 1956). For Plenderleith, who had painstakingly worked on treating the damaged objects after World War I, this was proof that preventive conservation was well worth the expense. 42What happened underground would influence the direction that work would take at the British Museum afterwards. Conservation could now move from what A.E.A. Werner (1960, 186-188) called “a purely empirical approach” to one that acknowledged scientific methods in order to study, as a first step, “preventive measures to protect antiquities and museum objects from deterioration under museum conditions.” Werner would succeed Plenderleith as Keeper of the British Museum Research Laboratory, when the latter moved to Rome in 1959 to become the first director of the newly established International Centre of the Study of the Preservation and Restoration of Cultural Property (ICCROM). 43In 1934, the physicist F.I.G. Rawlins was hired as the Gallery’s first Scientific Advisor to the Trustees, the first full-time scientist to be hired since Eastlake had rejected the idea 80 years earlier. Before the war, Rawlins conducted a few important studies on air pollution and on the relationship between water and the behaviour of wood (Rawlins 1954). The latter indicated that to minimize warping, in London, wood should remain in conditions maintained between 55-60% RH; this finding also echoed earlier specifications in the US from 1908 and 1915 (Brown & Rose 1997). 44Given the intensification of air raids, the National Gallery decided not to use the London Underground this time. About three days before war was declared on 3 September 1939, 1,800 paintings were evacuated, emptying the Gallery entirely (Rawlins 1946). An operation of such sizeable proportions could only be implemented so quickly with staff that was already trained in emergency response. In fact, in 1938 the National Gallery had organized a simulated evacuation exercise when the Nazi army invaded Czechoslovakia, since Britain would likely be entering into war (Bewer 2010). 45Initially, the paintings were housed in country homes and castles. By reducing air infiltration, ventilating and heating the spaces to 21°C, it was possible to maintain relative humidity at around 60%. 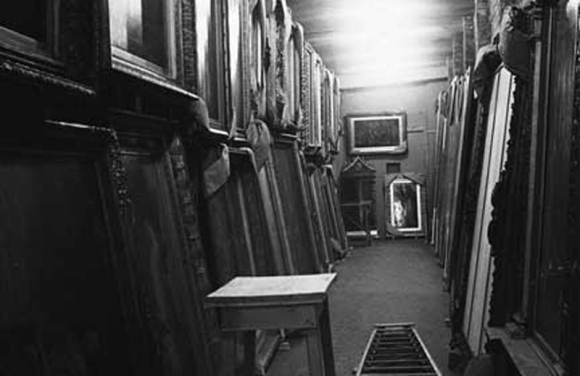 The paintings remained there for about two years, until the bombings worsened and it was decided that they should be stored underground (Rawlins 1946). 46Manod slate quarry in Wales was chosen because its entrance was already well connected to the main roads, and because electricity and water were available inside (Saunders 1992)(Figs 14-15). The paintings all arrived by summer 1941. Photo by kind permission of BRB (Residuary) Ltd. Courtesy of the National Gallery. Storage conditions allowed Gallery research to continue. 47Another advantage was that it would be possible to lower the relative humidity from saturation to 60% by simply increasing the temperature from 7.7°C to 15.5°C without any active dehumidification. Retrofitting the quarry took 11 months, during which 5,000 tons of debris was removed. Six brick buildings were built inside underground space to improve the efficiency of climate control. Each building was serviced by its own electrical heating and ventilation system. 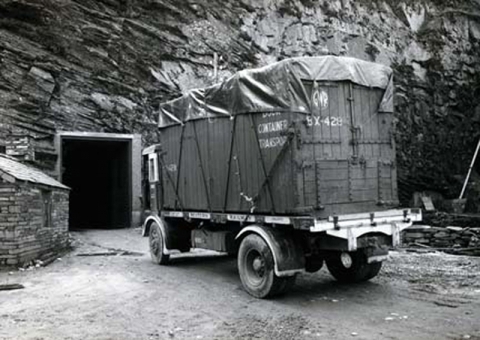 When work was completed, the quarry offered an impressive 1,630 m2 of storage space (Pallot 1946). There, the paintings remained for the duration of the war. 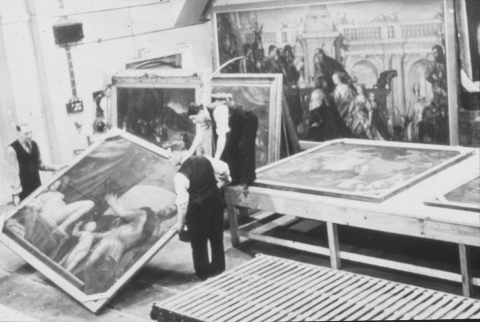 48When the National Gallery’s paintings were returned to London towards the end of 1945, their condition was impeccable… at least initially. For four years, the environmental conditions in the quarry had remained constant at 58±3% RH and 22.6±0.5°C, based on Rawlins’ recommendations. However, once back in the Gallery, an epidemic of flaking, blistering, cracking and warping ensued. 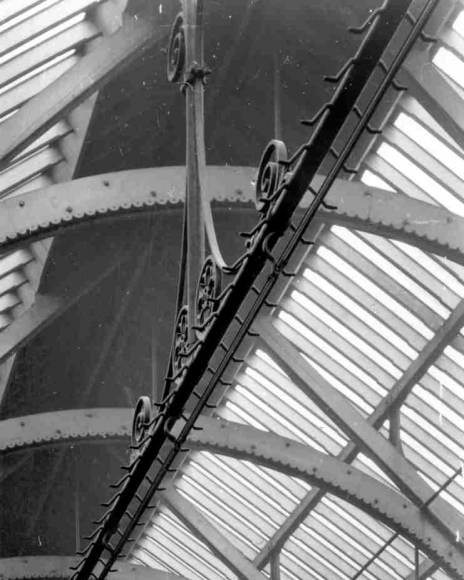 For Keeley and Rawlins (1951), this further strengthened the argument that air conditioning was needed, which as stated above, was installed in the Gallery starting in 1950. With the privilege of hindsight, however, it may not have been a good idea to bring these artworks back into a heated space in winter, since they were now acclimatized to tightly controlled conditions and because they had received periodic treatments by a conservator in these same conditions. 49Rawlins (1946) recognized the need to intensify research on physical, chemical and biological factors in the environment, both to prolong the life of the paintings and for plain economic reasons. While the paintings had been stored underground, the need for conservation treatments had progressively diminished to the point that the restorer was barely needed at all (Keeley and Rawlins 1951). If adopted, preventive conservation would prove to be cost effective in the long run. 50In the United States, museums were not directly under threat as in Europe. Yet, after Pearl Harbour was attacked on 7 December 1941, all of this changed. Stout recalls, “Everybody thought we were going to be bombed any moment the way London had been” (Stout, Buck & Gettens 1975, 9). 51Early in 1941, the American Association of Museums identified possible museum repositories (Bewer 2010). When collections were moved, it was somewhat chaotic: “Museums started moving objects around and setting up repositories [...] this was done in a very haphazard way,” as Richard D. Buck recalled (Stout, Buck & Gettens 1975, 9). Initially, the Fogg’s own collection had been dispersed in various locations by Forbes himself with the help of his vice director P.J. Sachs. When Stout was asked to manage the operations, his first decision was to regroup the works into one single repository in Harvard Forest about 100 kilometres from Cambridge, Massachussetts; this, he felt, would make the delivery of collections care more efficient (Stout, Buck & Gettens 1975, Stout 1978, II). 52Around this time, administrators from different museums had been meeting to review emergency preparedness measures like the reinforcement of skylights and glass display cases. Agnes Mongan, Sach’s research assistant at the Fogg, shared her recent experience in the participation in the simulated evacuation exercise organized at the National Gallery in London in 1938 (Bewer 2010). 53Nonetheless, Stout recognized that museum staff needed more information and guidance. Throughout 1942 and 1943, he published articles, pamphlets and guides on the wartime protection of collections; some in collaboration with W.G. Constable, founding director of the Courtauld Institute in London. He also organized a two-week workshop including lectures and demonstrations on protecting artworks from air raids, fire, gas attacks, shock, vibration, biological attacks, and also on packing, evacuation, storage, glass breakage and fire-retardant varnishes conceived by Gettens (Bewer 2010). “I think that from my point of view,” Buck later recalled, “[this workshop was] the first time that I felt the Fogg ever gave a very serious consideration of all of the environmental aspects of conservation” (Stout, Buck & Gettens 1975, 9). 54Recognizing the need to focus on prevention, Stout had tried to use the momentum created by the WWII efforts to promote “long-range conservation,” i.e. preventive conservation. At the time, he was very keen on developing a national strategy for conservation (Edsel 2010), but museum directors preferred to consider the training needs of museum professionals in general rather than those of conservators specifically. The idea was abandoned because of WWII, but also because Stout would leave for Europe to serve as one of the “Monuments Men,” responsible for moving collections from several Nazi caches (Bewer 2010). This experience in managing the care of entire collections would only have strengthened his belief that a more strategic approach was needed. [...] the blame for avoidable damage may be put as fairly on the museum officer who was in charge of an object fifty or more years earlier as on the man who happens to be in charge when the damage becomes obvious. [...] It would be impossible to figure the cost of neglect against the cost of constant care and much protection but it does not take much imagination to see that consistent care will save money as well as the integrity of objects. The hitch is to get the program started. Either you start it or you join the procession of figures who left their troubles to the next fellow. [...] There may be those who still think that the care of a collection is only a matter of occasional repair. They call in a qualified expert at the last moment when a particular object is so sour in tone or so broken that they obviously cannot keep it on exhibition. Nobody who has taken the pains to study materials has the notion that extreme deterioration sets in suddenly like a disease in a living organism. It is the accumulation of a slow process of change. At a certain point that change is plain for everyone to see. It may have been going on for years and its progress could have been slowed or even stopped. [...] Conservation is merely the business of trying to prevent undue deterioration. This effort requires the best available knowledge of the true state of the thing that is subject to deterioration. [...] The average person probably gets no great lift to his spirits by making an imaginary jump forward two or three hundred years in time. If you can bring yourself to do that, however, and then look back, you may have to face the conclusion that you belong to the contemptible company called ‘they.’ You know, of course, that museum officers had a lot of troubles in 1949, but, in spite of those, you can’t get away from the impression that they might have done a good deal better about this business of long-range conservation (Stout 1949, 7-8). 56By asking his colleagues to leap forward and visualize the consequences of their inaction, he was appealing–rather effectively–to their sense of professionalism and ethics in considering the impact of their decisions on future generations. He had singlehandedly defined the essence of preventive conservation, which begins by asking “why” we conserve instead of “what” (de Guichen 1995, 4). One of the most important recent advances in conservation is analogous to one made earlier in medicine – that it is more important to keep an object in good health than to restore it when it is sick. Consequently, among the first aims of a curator should be to secure a suitable physical environment for the objects with which he is concerned, not only in exhibition galleries but also in storages. [...] Here the curator will become involved with all kinds of experts, including professional conservators, architects, engineers and building superintendents. [...] Next comes the matter of safe conditions of exhibitions. Here the public are directly concerned; and the main problem is to find a balance between precautions and amenities. The days of ropes and barriers, and of pouncing policemen, have happily disappeared. [...] What is needed now is systematic research into the problems of environment and treatment. Much of this must inevitably be long-range in character if its results are to be reliable as a basis for action (Constable 1954, 97-100). 59After two consecutive experiences of unimaginable proportions affecting or threatening large quantities of objects simultaneously, it became clear to some that more efficient and effective solutions were needed to manage the conservation of entire collections. That however, would require a “profound change in mentality” (de Guichen 1995). In the following decades, international organizations such as IIC, ICCROM and ICOM would play a crucial part in promoting this change. Bewer, F.G. 2010. A Laboratory for Art. Harvard’s Fogg Museum and the Emergence of Conservation in America, 1900-1950. Cambridge, MA: Harvard Art Museums. Brommelle, N.S. 1956. Material for a History of Conservation. Studies in Conservation 2: 176-188. Reprinted in Staniforth (2013): 182-198 – see below. Brommelle, N.S. 1964. The Russell and Abney Report on the Action of Light on Water Colours. Studies in Conservation 9: 140-152. Caygill, M.L. 1992. The Protection of National Treasures at the British Museum during the First and Second World Wars. In: eds. J. Druzik et al. Materials Issues in Art and Archaeology III. Pittsburgh: Materials Research Society, 29-40. Constable, W.G. 1954. Curators and Conservation. Studies in Conservation 1(3): 97-102. Eastlake, C.L., Faraday, M. and Russell, W.S. 1850. Report of the Commission Appointed to Inquire into the State of the Pictures in the National Gallery. Reprinted in Staniforth (2013): 270-275 – see below. Edsel, R. 2010. The Monuments Men: Allied Heroes, Nazi Thieves and the Greatest Treasure Hunt in History. New York: Center Street. Lambert, S. 2008. Storia della conservazione preventiva. La formazione di una coscienza collettiva (thesis). University of Urbino, Italy. Muller, N. 2000. Slowing the Clock: Art Conservation at the Art Museum. Record of the Art Museum, Princeton University 59(1-2): 3-15. Pallot, A.C. 1946. Aménagement de refuges destinés à recevoir les oeuvres d'art et objets de musée en temps de guerre. Mouseion 55-56(1-2): 17-33. Plenderleith, H.J. 1943. Preservation of Museum Objects in War-time. Nature 152: 94-97. Plenderleith, H.J. 1956. The Conservation of Antiques and Works of Art. Treatment, repair, and restoration. London: Oxford University Press. Plenderleith, H.J. 1978. Dr. Harold Plenderleith - His Involvement in the Field of Art Conservation by C.L. Sitwell. FAIC Oral History File housed at the Winterthur Museum, Library, and Archives. Plenderleith, H.J. 1998. A History of Conservation. Studies in Conservation 43: 129-143. Rawlins, F.I.G. 1946. La conservation des tableaux dans les abris pendant la guerre. Quelques aspects scientifiques du problème. Mouseion 55-56 (1-2): 35-49. Rawlins, F.I.G. 1954. Physical Methods in the Care of Museum Objects. Bulletin of the Institute of Physics (April): 2-12. Reid, D.B. 1844. Illustrations of the Theory and Practice of Ventilation. Reprinted in Staniforth (2013) – see below. Saunders, D. 1992. The National Gallery at War. In: eds. J. Druzik et al. Materials Issues in Art and Archaeology III. Pittsburgh: Materials Research Society, 101-110. Select Committee. 1850a. Hearings cited in Brommelle (1956) – see above. Select Committee. 1850b. Report from the Select Committee on the National Gallery. Reprinted in Staniforth (2013): 90-95 – see below. Select Committee. 1853. Report from the Select Committee on the National Gallery. Reprinted in Staniforth (2013): 96-101 – see below. Staniforth, S. (ed). 2013. Historical Perspectives on Preventive Conservation. Los Angeles: Getty Conservation Institute. Stout, G.L. 1949. Long-range Conservation. Museum News (Sept): 7-8. Stout, G. L. 1978. Interview with George L. Stout I & II Menlo Park, California by P. Karlstrom. FAIC Oral History File housed at the Winterthur Museum, Library, and Archives. Stout, G.L., R. D. Buck and K. Gettens. 1975. History of Conservation-Roundtable Mexico City by W.T. Chase and J.H. Stoner. FAIC Oral History File housed at the Winterthur Museum, Library, and Archives. Swinney, G.N. 1999. Gas Lighting in British Museums and Galleries. Museum Management and Curatorship 18(2): 113-143. Swinney, G.N. 2003. The Evil of Vitiating and Heating the Air. Journal of the History of Collections 15(1): 83-112. Werner, A.E.A. 1976. Interview of A.E.A. Werner by W.T. Chase and J. H. Stoner. FAIC Oral History File housed at the Winterthur Museum, Library, and Archives.